You only need to setup your family once when you first register a player in your family. You must use an email address you check regularly, which you will need if you forget your username or password. You will only need to setup each player in your family once when you first register your player. You must register your player(s) for the current season. You must checkout and pay via credit card after registering your player(s). Your player(s) will not be registered or assigned to a team until your credit card transaction is processed and approved. The following are the per player registration dates, sessions dates and fees for Futsal session 1. There are no early or late registration periods and no early registration discount or late registration fee. Click your program below to register. Note: Winter Futsal Session 1 is under the Fall Registration link on Sportspilot. *No Class Saturday, December 29, 2018. The following are the per player registration dates, sessions dates and fees for Futsal session 2. There are no early or late registration periods and no early registration discount or late registration fee. Click your program below to register. Note: Winter Futsal Session 2 is under the Spring Registration link on Sportspilot. *No Class on Saturday, February 16 and February 23, 2019 (School Vacation). 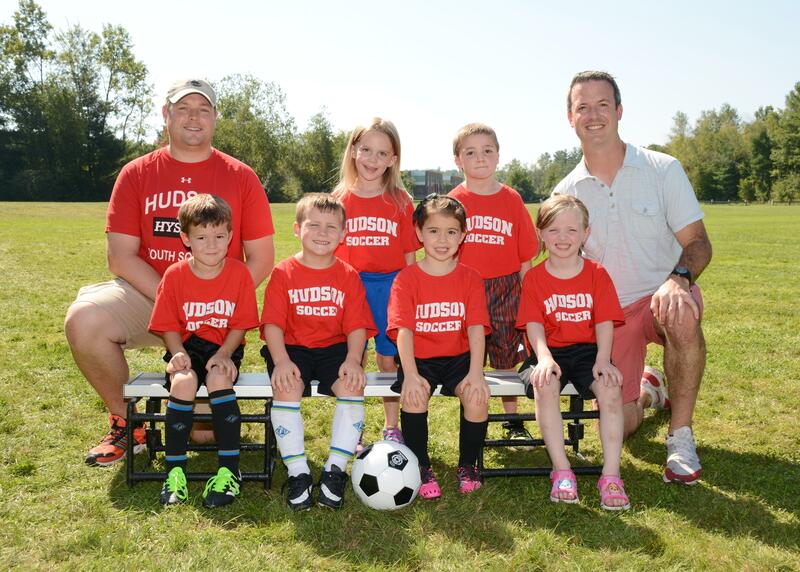 Hudson Youth Soccer has three registration periods each season, early, regular, and late registration. During early registration, Hudson Youth Soccer offers a discounted registration fee as stated below for the current season. During regular registration, the registration fee is the unadjusted fee as stated below for the current season. 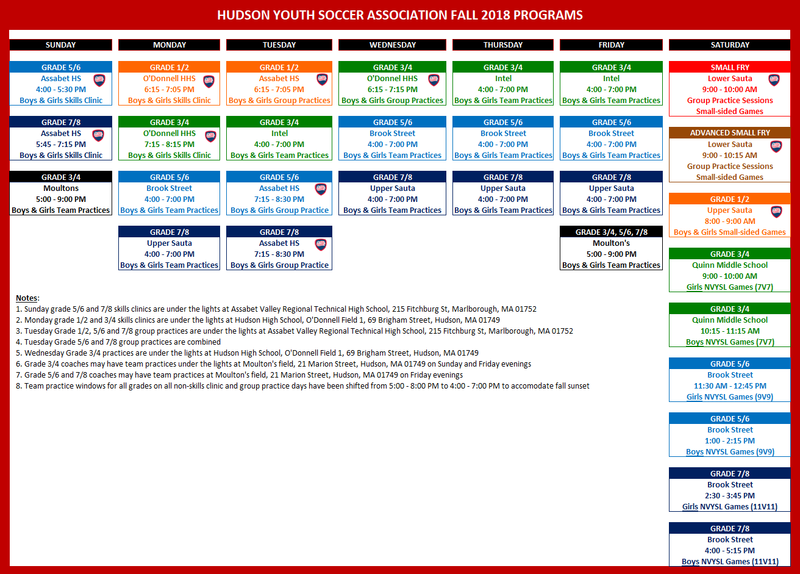 During late registration, Hudson Youth Soccer charges a late fee as stated below for the current season to offset fees the league and state organizations charge to Hudson Youth Soccer. The following are the registration deadlines for the current season. The following are the per player registration fees for the fall and spring seasons. Fall season runs from September to early November and the Spring season runs from April to early June. Hudson Youth Soccer also offers a $25 per player discount for the 2nd and 3rd or more players from the same family. Hudson Youth Soccer issues full refunds to players who either withdraw before the regular registration deadline or Hudson Youth Soccer does not place on a team prior to the start of the season due to roster size limitations or lack of program enrollment. A player conflict with another activity or sport does not trigger a refund and Hudson Youth Soccer will not issue a refund to any player after the regular registration deadline, except for players sustaining a season ending injury before the third game of the season, in which case Hudson Youth Soccer issues a 50% refund (a doctor’s note is required). Hudson Youth Soccer issues all refunds via a credit to the credit card the player parent used when registering the player(s) and deducts a 15% per player administration and processing fee from all refunds.